﻿ Alternative trio Hellbound Hearts produce their latest load of powerful impressions in a solidifying succession of enticing choruses and lively rhythms. The Yorkshire-bound group are releasing their first full-length album Film Noir following their previous succession of EPs. Each song provides a new and unique approach that supplies them with potential to stand out from the norm of heavy alt-rock. After a difficult path and scrapping the initial ground work for the album, what came out from the other side was Film Noir, ten tracks of fresh and bold sounds. With plenty of dark hooks and stand-out heavy riffs, the album attracts fans of Green Day while also bringing forth a sound similar to The Wildhearts. There is anger coupled with the right amount of energy and spirit that just makes the band even more admirable. Starting on a high with lead single Suffering The Radio, they entice the listener with a steady opener, then propelling right into a head-banging verse, complete with projective vocals from singer Danny Lambert. Many of the tracks initially open with slow burning riffs and Poor Disguises is another example, but kicks in at double speed, assembling a vibe much similar to the heaviness in Metallica. These comparisons are then shattered when the track morphs into a singalong upbeat chorus that totally baffles the listener in the best possible way. Still We Wait also begins unembellished, before turning to heavy riffs that could rock the walls of any room. The gain-filled guitars employ vividly with high ranged vocals that summit around a well-stocked chorus much like Billy Talent. There is a Volbeat-style Western vibe evident in tracks such as Blood, which brings forth the energy of straightforward, classic rock accompanied with catchy melodies that will have the song stuck in your head for days. The raspy guitars in the intro gets the ball rolling and then moves on further to delivers a hugely catchy chorus line. We end with Silent Horror Movie, which wastes no time in getting stuck in with dark, heavy sounds from guitars and drums alike: an instant reflection on the title of the track. What can only be described as something straight out of a horror movie soundtrack, the pure velocity of the song goes out to say that this band can’t be halted and won’t let anything stand in their way of making good music. With such varying tracks, the album is just the start of something great for Hellbound Hearts. An abundance of brilliantly dirty guitars and singalong choruses work wonders for the trio. With the capabilities to reach out to a large spectrum of audiences, there’s no doubt that the three of them are onto something ingenious. This is a face-melting debut album, addictive and full of brilliant mixes of tempo and momentum that keep you on your toes throughout the entire duration. 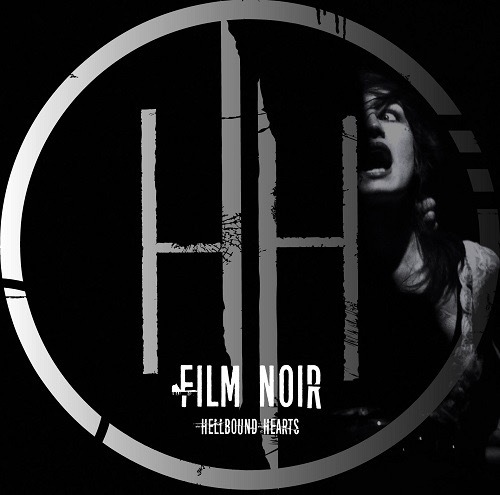 ‘Film Noir’ by Hellbound Hearts is released on 7th April.